Oil painting on canvas 34 x 42 inches in its antique giltwood frame. John Ferneley was born at Thrussington in Leicestershire, in the midst of the English Hunting Shires. His precocity attracted the attention of the Duke of Rutland, who persuaded his wheelwright father to apprentice him to the great Sporting Painter Ben Marshall. The latter became a life-long friend as well as teacher. Little of Ben Marshall's broad and vigorous technique is evident in his pupil's later free and refined style, though some of Ferneley's early works, such as those painted on his visits to Ireland between 1808 and 1812 have echoes of his Master. Ferneley’s most important early patron had been the young Duke of Rutland for whom he had painted several pictures in the years up to 1808, and it was the Duke, whose father had been Lord Lieutenant of Ireland, who gave him introductions to the sporting aristocracy f Ireland. He first arrived in Ireland in late 1808/early 1809, and stayed about a year, returning to Thrussington in November 1809. He had painted for such distinguished patrons as the Lords Lismore and Rossmore, the Earl of Belmore and the Trenches and O’Callaghans. He contrived to earn and save £180, enough to pay for his marriage to Sally Kettle shortly after his return to England. They stayed in England only a few weeks, returning to Ireland in the Spring of 1810, where they were received with generosity and affection by the clients of the previous year. In five months they amassed a small fortune of over £200 (compare this with a labourer’s weekly wage at the time of eight shillings (£0.40)). Ferneley rapidly established a distinguished English and Scottish clientele, and he and Herring were the Sporting Painters par excellence in the period 1820-1850. Ferneley was himself a keen sportsman, and he tells us in his (eccentrically spelled) surviving letters of his exploits in the field. Throughout most of his working life he kept a meticulous Book of Accounts, which enable the vast majority of his work to be traced and identified. This makes him the best-documented - not to say one of the most satisfying - Sporting Artists in the heyday of hunting. Ferneley was patronised at the highest levels of society, and he seems to have been accepted by the sporting grandees who were his patrons as an agreeable companion as well as a fine painter. He stayed, for instance, with family of the Earl of Kintore at Keith, where he not only painted numerous commissions, including a vast and splendid Hunting Conversation-piece but also took part in all the sports both equine and shooting, joining members of the family shooting game and stalking in the hills above Keith. He died on June 3rd 1860, and was buried at Thrussington. His sons, John Jr and Claude Lorraine, were competent sporting painters, though not in the same exalted class as their father. The present painting was conmissioned in 1842 by William Everard of Gosberton, an estate with large Georgian house near Spalding in the Lincolnshire fens, about 40 miles east of Melton Mowbray . 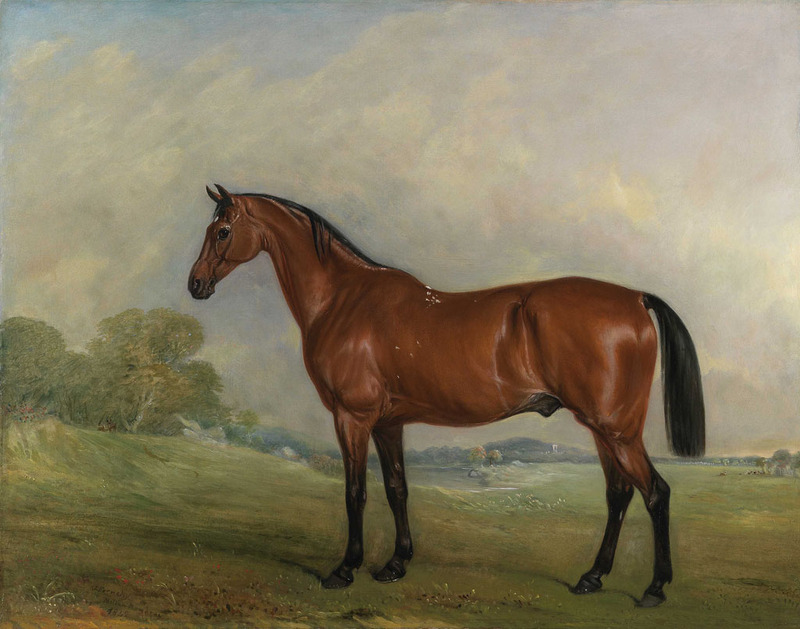 Everard was an occasional patron of Ferneley in the 1840's, ordering portraits of favourite horses.